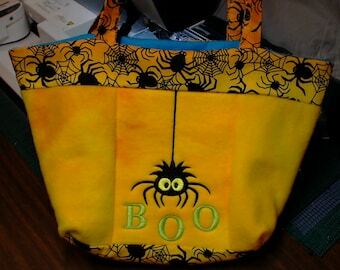 This bag is fully customizable! 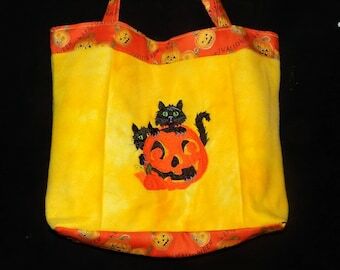 **THIS EXACT BAG IS SOLD** You will be ordering a custom bag of your very own! This gorgeous tote bag features a lot of style! 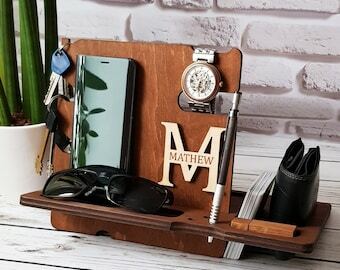 It's perfect for stashing your favorite treasures, journals, jewelry, crystals, tarot cards, dice, gaming supplies, cosmetics, a change of clothes (and/or shoes!) and more. It's generously sized and can even be used as an overnight bag. Super soft, yet extra sturdy, this padded bag is constructed from sueded flannel with contrasting trim and straps. The bag itself measures a generous 17" across and is 14" tall. 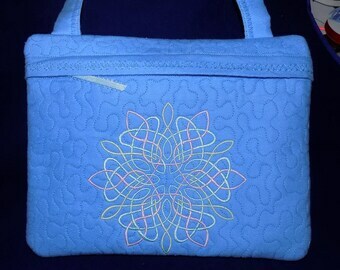 There are two felt patch pockets inside, so there is a safe place for a cell phone, etc. inside the purse. It's fully lined in a flannel fabric that matches the contrast trim and straps. 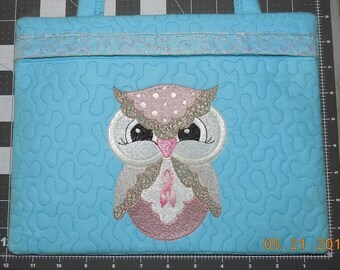 The bag *as shown* features embroidery designs with a total stitch count of 77,681. There are 17 unique threads used (16 for the front design and a 17th for the name on back of the bag!). The shoulder/crossbody straps provide about a 21" drop and the entire bag has been treated with stain and water repellent fabric treatment to add to durability. Fully machine washable, lay flat, hang or machine dry. 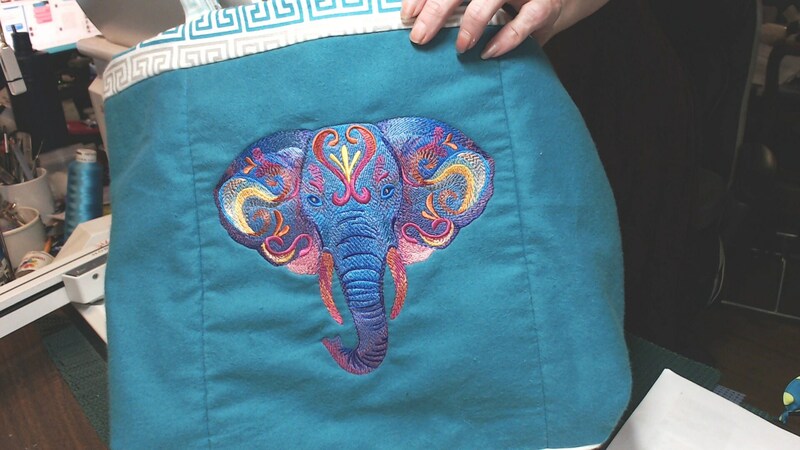 Iron on linen setting if desired. ***THIS EXACT PURSE IS ALREADY SOLD*** -- You will be custom ordering a bag of your very own! Custom orders are available to meet your color and design preferences -- let me know what color(s) you like and what kind of design you have in mind and I'll do the rest! Remember to include the name you'd like stitched on the bag! Here's some ideas to get you thinking -- Perhaps you like this design, but you really wish it was all in shades of blue. Or maybe you have a favorite bible verse or a quote you love. Perhaps you really like owls. Or frogs. Or cats, dogs, birds or furry lambs. Maybe you'd like your name, a quote or a monogram. A fairy, pixie or an angel. Pick a posie or a pretty tree. A stack of books. Maybe an owl reading a book. Like lemurs? Want a stack of 'em? (Speaking of stacks -- pick an animal, I probably have it!) Like Dragons or dinosaurs? What about a cross? An om. The star of David. Your zodiac sign, a yin yang (tao) symbol. Feeling minimalist? Want to keep it simple? There's always stipple quilting with no other embroidery, on a plain or patterned fabric. 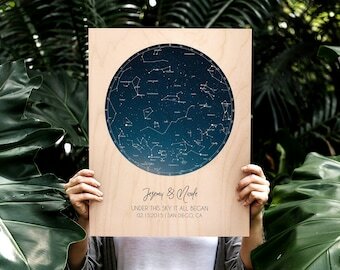 Feeling romantic and want it to be fancy? 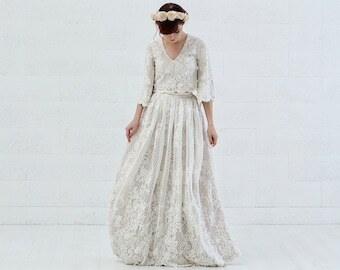 We can cover it in lace or add a shimmering organza overlay too! Add trim. Add a lace or eyelet accent to the flap. Add a strap. There, I've got you started -- now brainstorm! Your custom purse will be completed within one week of purchase *and* following finalization of design details. Your purchase includes the case only -- no devices or other contents are included! -- and will be sent to you via USPS priority mail in a large envelope.